Patients who see a physician shortly after hospital discharge have improved outcomes and reduced read‐missions. To promote follow‐up, Henry Ford Hospital will schedule patients for postdischarge follow‐up appointments (PDFUAs) prior to discharge. Yet patients often miss these appointments, perhaps because PDFUAs are not scheduled with patient input. To improve PDFUA attendance, we designed a patient‐centered PDFUA scheduling process and engaged nonclinical staff in improving this process. Our goal is to have hospitalized patients attend a PDFUA within 1 week of discharge, with either a primary care physician or a specialist related to the admission diagnosis. To achieve this goal, the Henry Ford ancillary staff (AS) created a “PDFUA Hotline” and patient‐centered PDFUA scheduling process. To request a PDFUA, hospitalists call the hotline and provide the following patient information: name, medical record number, hospital room number, discharge diagnosis, anticipated discharge date, appointments needed, and reason for the appointment. Next, the AS works with the patient or patient representative (PR) to identify barriers (i.e., transportation, patient/PR schedule) to PDFUA attendance and then schedules PDFUAs around these barriers. The AS also combines health care visits to improve patient attendance at other tests and appointments. After scheduling the PDFUAs, the AS adds the appointments to the electronic discharge summary. The AS also gives patients a list of all scheduled tests and appointments for the 3 months after discharge. The AS prints the schedule on fluorescent paper, includes a copy of it in the discharge paperwork, and mails it to the patient. During the first month of the hotline, the AS scheduled 130 PDFUAs for 95 patients (28% of hospitalist discharges). Although baseline PDFUA attendance rates are unknown, for these 95 patients, PDFUA attendance rates increased from 37% to 67% (Fig. 1). Only 5 of these patients (5.3%) were readmitted to the hospital within 30 days of their discharge, which is a 9.0% decrease from our baseline read‐mission rate of 14.3%. As an added benefit to the PDFUA scheduling project, interacting with patients engaged the AS in improving the discharge process. As a result, the AS used a series of root cause analyses and PDSA cycles to improve the PDFUA scheduling process. Although data from these changes is being collected, anecdotes suggest the process has improved, and AS job engagement has increased. A patient‐centered approach to scheduling PDFUAs decreases readmission rates. Engaging nonclinical staff in improving the discharge process can further enhance discharge safety. 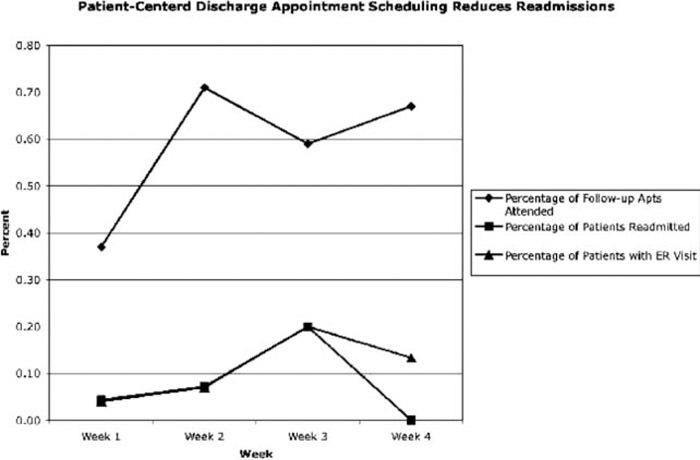 Coffey C, Kufta J. Patient‐Centered Postdischarge Appointment Scheduling Improves Readmission Rates. Abstract published at Hospital Medicine 2011, May 10-13, Dallas, Texas. Abstract 162. Journal of Hospital Medicine. 2011; 6 (suppl 2). https://www.shmabstracts.com/abstract/patientcentered-postdischarge-appointment-scheduling-improves-readmission-rates/. Accessed April 25, 2019.